Ireland named Johnny Sexton in its squad for the opening two Six Nations fixtures as the fly-half recovers from a knee injury. Johnny Sexton has been named in Ireland's squad for the opening two rounds of the Six Nations despite a knee tendon injury. Sexton has not played since suffering the setback in Leinster's defeat to Munster on 29 December. 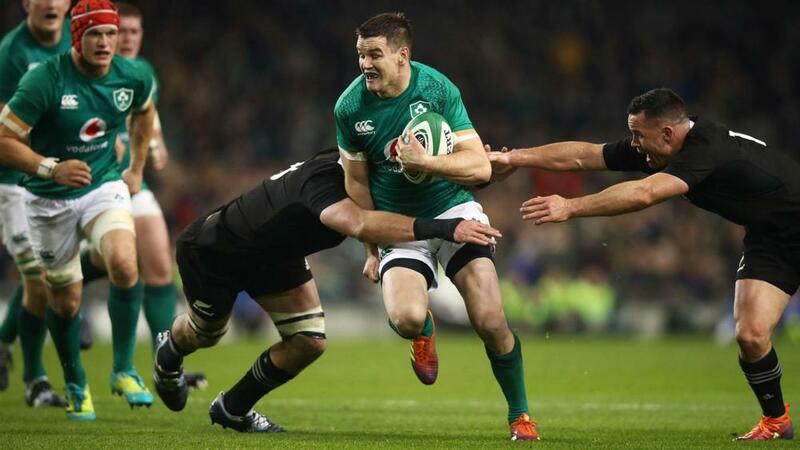 The 2018 World Rugby Player of the Year is reportedly not expected to play before Ireland begin their title defence against England in Dublin on 2 February. However, Ireland say the fly-half is making good progress and named him in a 38-man squad that features three uncapped players. All of that trio play for Connacht, with Caolin Blade, Jack Carty and Tom Farrell in contention to make their international bows under Joe Schmidt. The coach said: "It's been great to watch the provincial teams doing so well in recent weeks. "With another very competitive round of EPCR this weekend, the following Ireland squad for the first two matches of the Six Nations has been selected, knowing that late changes may be required, depending on how the matches go in the weekend. There have been a number of tight calls across almost every position." Commenting on those who missed out in the front row, Schmidt added: "In the front row, Finlay Bealham was very close, as was Marty Moore, who is getting back to the form that saw him win 10 caps in the past and Stephen Archer was at his combative best in Gloucester at the weekend." Conor Murray is back for Ireland after missing the opening months of the season because of a neck injury, the scrum-half missing all of its November internationals. There is likely to be extra impetus on Murray to perform, with a knee injury having ruled out fellow scrum-half Luke McGrath for the entirety of the Six Nations. Ireland travel to Murrayfield to face Scotland following their opener with England. Forwards: Rory Best (Ulster) (Captain), Tadhg Beirne (Munster), Jack Conan (Leinster), Sean Cronin (Leinster), Ultan Dillane (Connacht), Tadhg Furlong (Leinster), Cian Healy (Leinster), Iain Henderson (Ulster), Dave Kilcoyne (Munster), Jack McGrath (Leinster), Jordi Murphy (Ulster), Sean O'Brien (Leinster), Peter O'Mahony (Munster), Andrew Porter (Leinster), Rhys Ruddock (Leinster), James Ryan (Leinster), John Ryan (Munster), Niall Scannell (Munster), CJ Stander (Munster), Devin Toner (Leinster), Josh van der Flier (Leinster). Backs: Will Addison (Ulster), Bundee Aki (Connacht), Caolin Blade (Connacht), Joey Carbery (Munster), Jack Carty (Connacht), Andrew Conway (Munster), John Cooney (Ulster), Keith Earls (Munster), Chris Farrell (Munster), Tom Farrell (Connacht), Robbie Henshaw (Leinster), Rob Kearney (Leinster), Jordan Larmour (Leinster), Conor Murray (Munster), Garry Ringrose (Leinster), Johnny Sexton (Leinster), Jacob Stockdale (Ulster).